Corliss Williamson played basketball at Russellville High School, where he achieved numerous accolades. He was a three-time all-conference and all-state selection, and was named the Gatorade National Player of the Year in 1991 and 1992. Prior to his senior year, Williamson held his own against future teammate Chris Webber in an AAU championship game, getting 37 points to Webber's 38 points. As a senior Williamson averaged twenty-eight points and nine rebounds per game, and led his team to the King Cotton Classic championship. In the title game, Russellville defeated a team led by Jason Kidd, with Williamson blocking a potential game-winner by Kidd at the buzzer. Williamson was named tournament MVP, but gave his medal to Kidd at the award podium. Williamson closed out his high school career with a selection to play in the 1992 McDonald's All-American Game. He came in second in scoring to game MVP Othella Harrington, with fourteen points, and also had ten rebounds. His #34 jersey has been retired by Russellville High and hangs on the wall of the school's arena, along with his McDonald's All-American jersey. Williamson played at the University of Arkansas for head coach Nolan Richardson from 1992 to 1995. In the 1992–93 season, Williamson led Arkansas to a 22–9 record and a Sweet 16 appearance in the NCAA Tournament, losing to the eventual national champion, the North Carolina Tar Heels. Williamson averaged 14.6 points and 5.1 rebounds per game, and was named to the SEC All-Freshman Team. In the 1993-94 season Williamson was named Most Outstanding Player of the NCAA Tournament while leading the Razorbacks to a 31–3 record and their only championship under coach Richardson by defeating the Duke Blue Devils, 76-72, in the title game. Williamson led the team into the championship game in 1995 as well, but Arkansas lost to UCLA, finishing 32–7. In three seasons at Arkansas, Williamson was named to the SEC All-Freshman Team in 1993, and was 1st Team All-SEC in 1993, 1994, and 1995. He was also named the SEC Player of the Year for the 1993–94 and 1994–95 seasons, and was named 2nd Team All-American for both years as well. In addition to the 1994 NCAA National Championship, Williamson also led the Razorbacks to the SEC West Division title all three seasons, and the SEC regular season championship in 1994. Williamson finished his career at Arkansas with 1,728 points, which ranks 8th all-time in school history. Williamson was inducted into the Arkansas Sports Hall of Fame in 2009. His jersey (#34) is one of only two that have ever been retired by the University of Arkansas, along with Sidney Moncrief (#32). He is considered one of the five greatest players in school history. 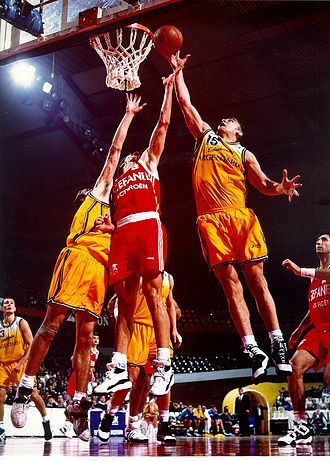 Williamson declared for the NBA Draft following his junior season, and was selected by the Sacramento Kings as a lottery pick (13th overall) in the first round of the 1995 NBA Draft. His best career year was in the 1997–98 season when he played 79 games and averaged 17.7 points per game for the Kings, finishing second to Alan Henderson for the NBA Most Improved Player Award. 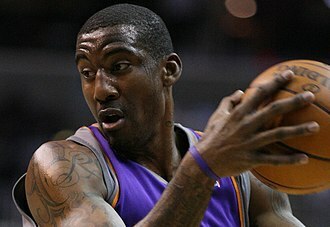 After Sacramento traded him prior to the 2000–01 season to the Toronto Raptors (in exchange for Doug Christie), for whom he played 42 games, Williamson was traded to the Detroit Pistons, along with Kornel David, Tyrone Corbin, and a 2005 first-round draft choice in a package for Jerome Williams and Eric Montross. In the 2001–02 season he was named the NBA's Sixth Man of the Year and eventually was a member of the Pistons' 2003–04 NBA Championship team. Although coming off the bench, Williamson served a pivotal role in the Detroit offense. His coaches often looked to him in the low post when the Pistons needed a basket, where his unique skill set made him a difficult matchup as he was too powerful for small forwards to guard and too quick for power forwards. 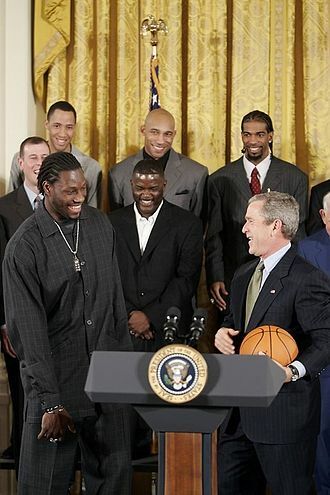 After being traded by the Pistons along with an undisclosed amount of cash to the Philadelphia 76ers for Derrick Coleman and Amal McCaskill on August 8, 2004, he was again traded back to the Kings along with Brian Skinner and Kenny Thomas for power forward Chris Webber on February 22, 2005. 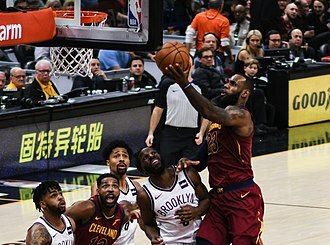 Williamson has the distinction of being one of the few professional basketball players to win championships at three different levels, AAU, the NCAA with Arkansas, and the NBA with Detroit. Williamson announced his retirement in September 2007 to become an assistant coach at Arkansas Baptist College. He worked as a volunteer coach during his three years at Arkansas Baptist, succeeding Charles Ripley as the head coach for his final season at the school. On March 12, 2010, Williamson was announced as the men's head basketball coach at the University of Central Arkansas in Conway, Arkansas. Promising to play an exciting style of play similar to his former head coach Nolan Richardson, Williamson's teams improved gradually each season, but still never won more than half of their games. On August 2, 2013, Williamson left Central Arkansas to become an assistant for the Sacramento Kings. On June 29, 2016, it was announced that Williamson had left the Kings to take an assistant coaching position with the Orlando Magic under new head coach Frank Vogel. Vogel previously was an assistant coach to Williamson back when he played under the 76ers. However, after Frank Vogel was fired in 2018, Williamson would also be fired as well. On May 22, 2018, it was announced that Williamson would be hired by the Phoenix Suns as an assistant coach under new head coach Igor Kokoškov. 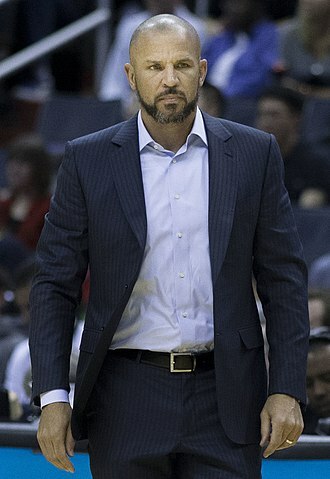 Williamson was previously connected to Igor by playing under him back when Kokoškov was an assistant coach for the Detroit Pistons during the 2003–04 championship season. ^ a b c "Corliss Williamson." www.basketball-reference.com. Retrieved April 5, 2014. ^ a b c Woodson, Craig. "Corliss Williamson: Title Taker." www.searcyliving.net, August 2008. Retrieved May 30, 2014. ^ "Corliss Mondari Williamson (1973–)." 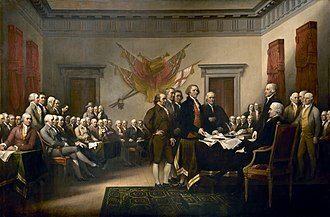 www.encyclopediaofarkansas.net. Retrieved April 5, 2014. ^ "McDonald's All-American: Boys Alumni." www.mcdonaldsallamerican.com. Retrieved February 25, 2012. ^ "McDonalds High School Basketball All-American Teams." www.basketball-reference.com. Retrieved April 5, 2014. ^ Historical timeline for McDonald's game Retrieved February 25, 2012. ^ "Corliss Williamson - Class of 2009." www.arkansassportshalloffame.com. Retrieved November 13, 2017. ^ Associated Press. "Williamson to retire, take assistant job at Arkansas Baptist College." www.espn.com, September 25, 2007. Retrieved April 5, 2014. ^ "Corliss Williamson's coaching record." www.basketball-reference.com. Retrieved February 7, 2013. ^ "Sacramento Kings hire Corliss Williamson as an assistant coach". InsideHoops.com. August 2, 2013. Retrieved August 2, 2013. ^ Carter, Jimmy. 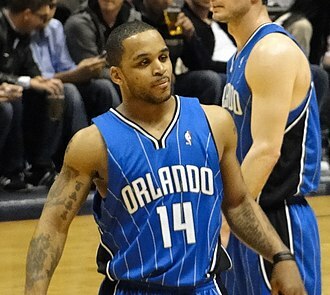 "Williamson Joins Orlando Magic Staff." www.wholehogsports.com, June 29, 2016. Retrieved December 2, 2016. The Duke Blue Devils are the athletic teams that represent Duke University. Its 26 varsity teams compete in the Atlantic Coast Conference, the name comes from the French les Diables Bleus or the Blue Devils, which was the nickname given during World War I to the Chasseurs Alpins, the French Alpine light infantry battalion. The Blue Devils have won sixteen NCAA National Championships, the womens golf team has won six, the mens basketball team has won five, mens lacrosse has won three, and the mens soccer and womens tennis teams have won one each. 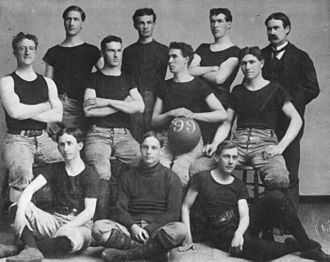 Dukes major historic rival, especially in basketball, has been the Tar Heels of the University of North Carolina at Chapel Hill, Duke has captured 119 ACC Championships,44 of which have come since 1999–2000. Dukes teams hold the longest streak of consecutive ACC Championships in womens tennis, womens golf, mens basketball, in the past five years, Duke has finished in the top 20 every year in the NACDA Directors Cup, an overall measure of an institutions athletic success. Most recently, Duke has finished 10th, 17th, 19th, 11th, Duke has the smallest undergraduate enrollment of any institution that has been in the top 35 the past two years. Furthermore, Duke is the school besides Stanford that has finished in the top 20 in the past three years that has fewer than 10,000 undergraduates. Eight of these teams were ranked either first or second in the country during 2004–05, according to a 2006 evaluation conducted by the NCAA, Dukes student-athletes have the highest graduation rate of any institution in the nation at 91%. Excluding students who leave or transfer in good standing, the graduation rate of student-athletes is 97%. S. Duke University sponsors teams in mens, twelve womens, and one coed NCAA sanctioned sports. ^Duke will launch a varsity team in 2017–2018. Additionally, Duke has had an Academic All-American on the fourteen years. Duke has 19 Atlantic Coast Conference tournament championships, the most of any team in the ACC, Duke has been the top seed in the ACC tournament 19 times. Russellville is the county seat and largest city in Pope County, United States, with a population of 27,920, according to the 2010 Census. It is home to Arkansas Tech University and Arkansas Nuclear One, Russellville borders Lake Dardanelle and the Arkansas River. It is the city of the Russellville Micropolitan Statistical Area. Before the town was named Russellville, it was known as Chactas Prairie, The Prairie, in the early 19th century, Osage from Missouri hunted frequently in the valley where Russellville is located. Between 1818 and 1828, the area was within a Cherokee reservation, but after 1828 the Cherokee were removed to Indian Territory, the first settler in the area was P. C. One year later, Dr. Thomas Russell bought Holledgers house, the first business to be established in the town was owned by Mr. Shinn, who built a masonry structure to replace his wooden store in 1875. This building still exists today, and is known as the Shinn Building and it was built at the intersection of an east-west road from Little Rock to Fort Smith and a north-south buffalo trail to a ford on the Arkansas River. Early travelers used these trails to pass through the valley. When the towns decided to name the town, it came down to two choices, Shinnville or Russellville, and Russellville won. As with the war with Mexico in the 1840s, many men of Russellville served in the military forces during the American Civil War. Local men served in the forces early in the war. 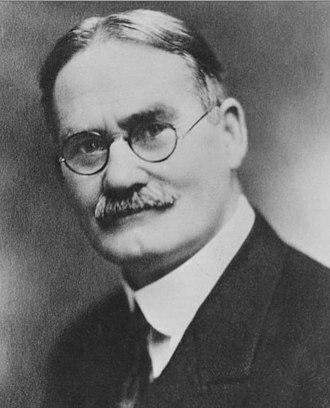 Several local men were formed into at least two pro-Union companies. No great battles occurred in or near Russellville, though actions did take place late in the war at nearby Dardanelle, while the war came to an official end in 1865, peace did not immediately return to the area. Many areas of Pope County were disrupted in the early 1870s by the bloody, the town grew slowly, but during the early 1870s the railroad was built and the town exploded commercially and experienced a boom in population. Russellville’s first newspaper, the Herald was founded in 1870, by 1876, the town boasted a population of approximately 800 serviced by fifteen stores, two cotton gins, and six doctors. Mayce Edward Christopher Chris Webber III is an American retired professional basketball player. He is a five-time NBA All-Star, a five-time All-NBA Team member, a former NBA Rookie of the Year, and a former number one overall NBA draftee. However, Webber was indicted by a grand jury and stripped of his All-American honors by the NCAA as a result of his direct involvement in the Ed Martin scandal. He is a former National High School Basketball Player of the Year who led his high school Detroit Country Day to three Michigan State High School Basketball Championships. He played middle school basketball at Riverside Middle School at Dearborn Heights, Webber attended Detroit Country Day School and at the time was the most recruited Michigan high school basketball player since Magic Johnson. Webber led Country Day to three MHSAA State championships, as a senior in high school Webber averaged 29.4 points and 13 rebounds per game. He was named Michigans Mr. Basketball and the 1990–1991 National High School player of the year and he was named MVP in both the McDonalds and Dapper Dan All-Star games. After graduating from Detroit Country Day School, Webber attended the University of Michigan for two years, while a Michigan Wolverine, Webber led the group of players known as the Fab Five, which included himself, Juwan Howard, Jalen Rose, Jimmy King, and Ray Jackson. This group, all of whom entered Michigan as freshmen in the fall of 1991, took the team to the NCAA finals twice. The Fab Five, sporting long, baggy shorts and black socks, Four of the Fab Five made it to the NBA. On April 5,1993, at Michigans second consecutive NCAA Mens Division I Basketball Championship game with 11 seconds remaining, Webber attempted to call for a timeout while his team had none remaining, resulting in a technical foul that effectively clinched the game for North Carolina. His father has a plate that says timeout. The game marked the end of Webbers acclaimed two-year collegiate basketball career, in his second season, he was a first team All-American selection and a finalist for the John R. Wooden Award and Naismith College Player of the Year. Nolan Richardson Jr. is a former American basketball head coach best known for his tenure at the University of Arkansas, where he won the 1994 NCAA Mens Division I Basketball Tournament. During his 22 seasons of coaching in NCAA Division I, Richardson made a tournament appearance 20 times. 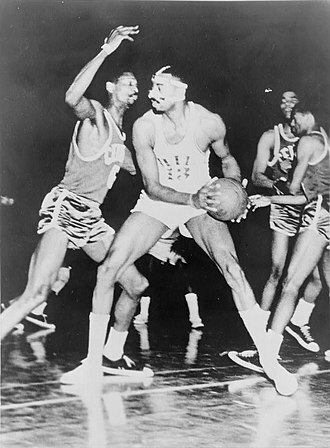 Richardson was born in El Segundo Barrio in El Paso, United States to Nolan Richardson Sr. Clareast died from a mysterious disease in 1944, leaving behind three children, age 5, Nolan Jr. three, and Helen, six months. Eventually they moved in with the grandmother, Rose Richardson or Ol Mama. Ol Mama had a impact on Nolan by helping instill the drive. Nolans father would visit, but often did not live with the family, Nolan Richardson played college basketball at Texas Western College, playing his junior and senior years under Hall of Fame coach Don Haskins for the Miners. Richardson began his career at Bowie High School in El Paso. He moved to Western Texas Junior College, where he won the National Junior College championship in 1980, Richardson was the head coach at Tulsa from 1981 to 1985, leading Tulsa to the NIT championship in 1981. This was the first time an African American coach won an NIT championship, Nolan had a.763 winning percentage at the school. He became the first coach in NCAA history to win 50 games in his first two seasons, while coaching at Tulsa, Richardson became known for wearing an assortment of polka dot ties. This trademark eventually led Tulsa students to don polka dots during home games, in 1985, Richardson became the head coach at the University of Arkansas after Eddie Sutton left for Kentucky. Richardson became the first African-American coach at a university in the South. He inherited a team and program that was used to Suttons halfcourt-oriented, Richardsons frenetic, up-tempo system was something new to Arkansas fans, and people questioned it after finishing 12-16 his first season. However, by year two he had Arkansas back in the post season with an NIT berth, by year three he had Arkansas in the NCAA Tournament. The Hogs would stay there for 13 of the next 15 seasons, in all, Arkansas under Richardson enjoyed 15 post season appearances during the 17 seasons of his tenure. The University of Arkansas is a public, co-educational, land-grant, space-grant, research university in Fayetteville, in the U. S. state of Arkansas. More than 26,000 students are enrolled in over 188 undergraduate, graduate and it is classified by the Carnegie Foundation as a research university with highest research activity. Founded as Arkansas Industrial University in 1871, its present name was adopted in 1899 and it is noted for its strong architecture, business, communication disorders, creative writing, history and Middle Eastern studies programs. Enrollment for the semester of 2014 was 26,237. Academic programs are in excess of 200, the ratio of students to faculty is approximately 19,1. 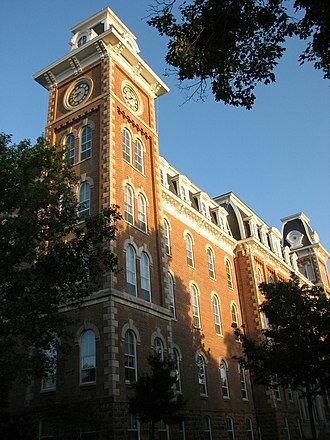 The University of Arkansas was founded in 1871 on the site of a farm that overlooked the Ozark Mountains. The university was established under the Morrill Land-Grant Colleges Act of 1862, the universitys founding satisfied the provision in the Arkansas Constitution of 1868 that the General Assembly was to establish and maintain a State University. Bids from state towns and counties determined the universitys location, the citizens of Fayetteville and Washington County. Pledged $130,000 toward securing the university, a sum that proved to be more than other offers, classes started on January 22,1872. Completed in 1875, Old Main, a brick building designed in the Second Empire style, was the primary instructional. It is listed on the National Register of Historic Places and its design was based on the plans for the main academic building at the University of Illinois, which has since been demolished. However, the clock and bell towers were switched at Arkansas, the northern taller tower is the bell tower, and the southern shorter tower is the clock tower. One legend for the switch is that the taller tower was put to the north as a reminder of the Union victory during the Civil War. A second legend is that the contractor accidentally swapped the tower drawings after having had too much to drink, although the southern tower was designed with clock faces, it never held a working clock until October 2005. Arkansas Baptist College is a private, historically black liberal arts college located in Little Rock, Arkansas. Founded in 1884 as the Ministers Institute, ABC was initially funded by the Colored Baptists of the State of Arkansas and it is the only historically black Baptist school west of the Mississippi River. The main building on its campus, built in 1893, is one of the oldest surviving buildings in the state. Joseph L. Jones, serves as the 14th president of the college, Jones first day in office was September 1,2016. The schools baseball team competes in Region 2 of the National Junior College Athletic Association, the schools baseball program plays part of its schedule at Gary Hogan Field in Little Rock. The Buffs Head Baseball Coach is Roger Mallison Arkansas Baptist College was accredited by the Higher Learning Commission in 1987, in February 2014 the Commission placed the college on notice that it was at risk for being out of compliance with the Commissions criteria for accreditation. Estes Stadium west side with players in action.